Representatives from the different parties recount the votes in districts where unofficial results are being challenged, April 2, 2019. It's been almost a week since Turkey held its local elections. Although the victory of the People's Alliance, led by the ruling Justice and Development Party (AK Party) and Nationalist Movement Party (MHP), already appears to be clear all around the country, the post-election period is still waiting for the legal process to end with the announcement of official results. The legal process has significance especially for provinces such as Istanbul where there is an ongoing reassessment of votes after political parties objected to the initial outcome. While there is some disinformation regarding this process, the development of events in the aftermath of the election is actually evolving in accordance with the principles of democracy and the rule of law. The legal process is being conducted by the top election body of the country, which will mark the final decision in the end. "The election process has ended and the legal process has started," President Recep Tayyip Erdoğan said on Friday, defining the post-election period. Expressing that political parties are using their "most natural" right to object to any issues, Erdoğan underlined that this is quite a normal period that takes place in the aftermath of almost all elections. "The YSK [Supreme Election Council] is the boss of the process, so to speak," he added, pointing at the importance of the legal process. The AK Party applied to the Istanbul provincial election board on Friday for a total recount of all votes cast in the province in the local elections. This demand is the continuation of the previous objections of the party, in which it had officially challenged the poll results in all 39 districts of Istanbul, according to the provincial head of the party Bayram Şenocak. According to unofficial results, opposition candidate Ekrem İmamoğlu, the candidate of the Nation Alliance made up of the Republican People's Party (CHP) and Good Party (İP), held a narrow 22,000-vote lead over his opponent Binali Yıldırım, the candidate of the People's Alliance. "We have detected significant discrepancies among the tabulated results with wet signatures and stamps, which shows the first vote record, the final record and the total number of votes submitted to the YSK," Şenocak told reporters. 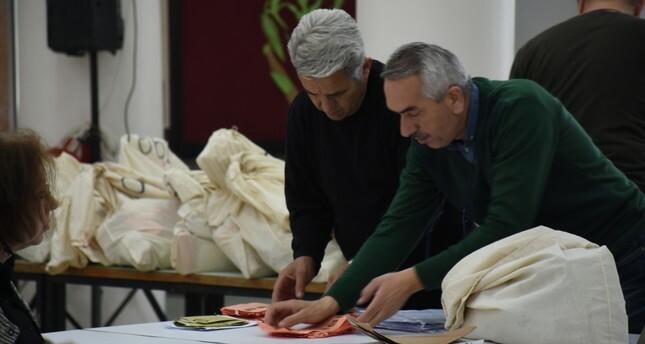 As a result, the invalid votes in all the districts of Istanbul are being recounted while all of the votes are being reassessed in four districts. Speaking on the issue on Thursday, AK Party spokesperson Ömer Çelik also said that the mandate will be given to person the people have chosen, which will be revealed after the reassessment is finalized. Çelik criticized some individuals who he said "constantly express discomfort over the legal process, trying to defame it while they should respect it since this is a country where there is rule of law." "Everything is normal in the country. Acting as if there is something abnormal going on, trying to underline a stress that does not exist, trying to put pressure on the people, implying some false claims that would pit people against each other are not true," Çelik emphasized, referring to the disinformation that is circulating mostly on social media. He further said that the aim of this legal process to protect the votes of every single citizen regardless of their political affiliation. He also added that the votes are being reassessed by the YSK but "the process is going on in front of the eyes of representatives from every political party." "In the end, the winner will be democracy," Çelik underlined. Although there is impatience regarding the process, it is actually a regular scene in Turkey's elections as no mayor in the previous elections received his or her mandate after the elections before the legal process ended. In the 1999 local elections, Ali Müfit Gürtuna, the winner of Istanbul at that time, took his mayoral mandate eight days after the elections. Similarly, Kadir Topbaş, who was the mayor of Istanbul for two terms following Gürtuna, received his mandate after five days the first time he won and after nine days the second time he won. According to the latest recounts, the difference between the votes of Yıldırım and İmamoğlu decreased to 18,000 from the 29,000. Yıldırım said on Friday that although the number varies constantly, the difference between the number of votes is also decreasing constantly. Şenocak also said on Friday that, in the aftermath of the objections, Yıldırım had 12,300 more votes so far. "The number keeps increasing," Şenocak said. He also pointed at the transparency of the reassessment process, emphasizing that the procedure is taking place in a crystal-clear environment. Erdoğan also expressed yesterday that so far, as a result of the objections, the percentage of AK Party's votes all around the country reached 53.3 percent. The president also criticized the West for intervening in Turkey's domestic issues by reminding them of their own elections processes. "You [the Western states] have made these kinds of objections numerous times before within your countries. There are lots of examples of this process in the West. Thus, Europe and the U.S. should know their place [and act in that way]," Erdoğan expressed. Some of the most prominent examples of the recount of the votes in the western world took place in U.S. In 2000, following the presidential elections that took place between George W. Bush and Al Gore, it was revealed that the vote difference between the two candidates was quite small in the state of Florida with Al Gore taking the lead. After the votes were recounted, Bush received 2,912,790 of the votes, winning the election against Al Gore who received 2,912,253 of the votes. A similar case took place in Florida once again in 2018 during the senate elections where the votes were recounted two times in two weeks. The 2016 presidential elections witnessed recounting incidents more than once. One of them took place in the state of Nevada while others took place in Michigan and Wisconsin, where the votes were recounted with the objection of the Democrat candidate Hillary Clinton. As a result, in Wisconsin, Clinton's rival Donald Trump increased his number of votes. Another example of recounting votes took place in Austria during 2016 presidential elections as the votes were reassessed with the claims that there were some "major irregularities." Similarly, during the 2009 presidential elections in Romania, votes were recounted as a result of the objections by the country's Social Democrat Party.